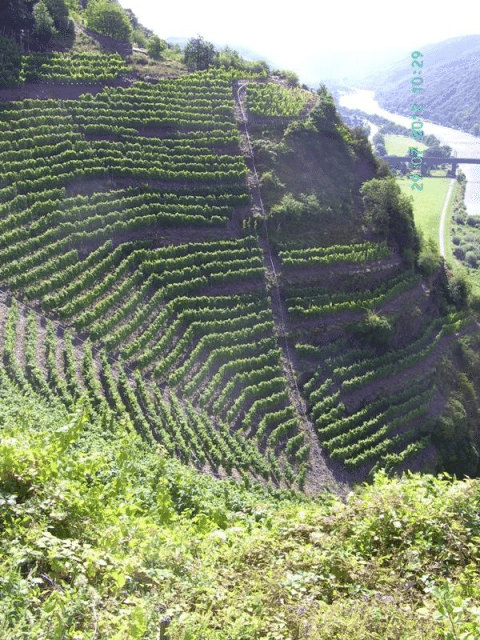 Believed to be the steepest vineyard in Europe, Bremmer Calmont is a single vineyard in Bremm on the Mosel, Germany. Its vines are planted at a perilous 68 degree angle, making harvest time a hair-raising endeavour. Mostly Riesling is planted on its 33 hectares, with harvesters scaling the vines using a network of chairs on rails. The vineyards are currently tended by Walter J Oster, which produces a dry Riesling from the vines. The mineral-rich shale soils of this vineyard are said to create fine fruity Riesling wines with “filigree and fine fruity nuances”, according to its website, with “mineral aromas” that become more intense with age.